In addition, our law firm’s attorneys are highly skilled and knowledgeable in all aspects of corporate law. We work closely with our commercial clients, taking the time to listen to their concerns and understand their goals and objectives. We then advise them on which business entity form will best serve not only their existing needs but also their long-term needs as their companies grow and expand. 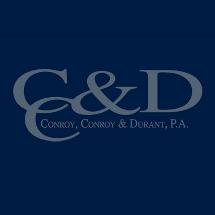 Conroy, Conroy & Durant, P.A., is proud to be AV* peer rated by Martindale-Hubbell for our ethical standards and legal ability. This rating assures our clients that our attorneys and highly trained staff are a team dedicated to their success. We also accept all major credit cards for our clients’ maximum convenience.